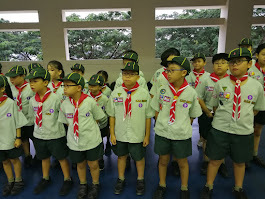 If you were absent yesterday, please collect the consent form for our Investiture Camp coming up on 3 to 4 March from either Mr Chan Wei Shen (KRC office) or Ms Sarina (CRC office). You may also take it from locker #115 near KRC level 2 near lost & found area if you cannot find the teachers. Do return the forms to us by 24 Feb, Friday or during CCA itself.